Eurol introduces two new engine oils and coolants | Eurol B.V.
Eurol introduces Syntence LV 0W-20, suitable for the latest generation VAG-engines and Eurol Ultrance VA 0W-30, an engine oil suitable for most Volvo engines, providing an improved fuel economy. Furthermore we now offer you two new coolants: Eurol Coolant -36°C PSC for Peugeot and Citroën and Eurol Coolant -36°C RND for Renault, Nissan and Dacia. Eurol Syntence LV 0W-20 is a longlife PAO-based oil formulation suitable for gasoline and diesel engines, specifically for Volkswagen, Audi, Skoda and Seat vehicles requiring the VW 508.00/509.00 specification. The engine oil is recommended for the 140 kW 2.0 TFSI with motor code EA888, the 3.0 TDI (EA897) and the new 1.5 TSI-power unit. Eurol Ultrance VA 0W-30 is suitable for a wide range of Volvo engines (B5, B6, B8, D5, D82 and D87) applied in various Volvo models ranging from the C30 to the XC90, enabling the engine to perform under all operating conditions (motorway and urban traffic) due to its special additive package. enables the engine to perform under severe driving conditions (motorway and urban traffic) due to its special additive package. offers an improved fuel economy (min. 4% benefit when compared to a SAE 15W-40 reference oil) and exhaust emission reduction can be obtained with this product. universal applicability in certain modern engines Euro-4, Euro-5 and Euro-6, diesel or gasoline, naturally aspirated or turbocharged, indirect or direct injection, requiring a SAE 0W-30 with ACEA A5/B5 and API SL specifications. provides excellent performance in piston cleanliness, in reducing the formation of sludge and in keeping the turbocharger clean. improved fuel economy (min 5% in comparison with a mineral SAE 15W-40) and low emission reduction for powerful engines can be obtained with this product. 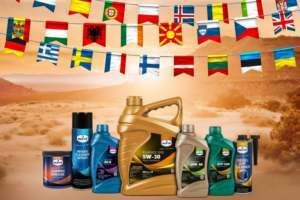 Both new oil products are available in a packaging of 1 liter and 5 liter. Eurol Coolant -36°C PSC e50414 is a coolant especially developed for Peugeot and Citroën cooling systems from 2000 onwards and is available in a 1 liter and 5 liter packaging. Eurol Coolant -36°C RND e504012 is a coolant specifically developed for all Renault, Nissan and Dacia cooling systems. This coolant will also be available in a 1 liter and 5 liter packaging.